Don't Feel Like Reading Today? 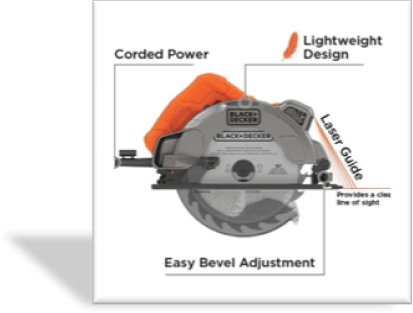 Here's A Quick Rundown Of The Black and Decker Circular Saw Review. This Black and Decker circular saw comes with laser guided vision for straight line cuts and spindle lock for quick blade replacement. Model BDECS300C is ideal for budget conscious buyers on a shoestring budget due to its price range. This Black and Decker corded circular saw even comes with a 2 year warranty and this saw can be considered as a recommended tool for beginner level users. Voltage Source Might Be an Issue! Is This Corded Circular Saw for Me? Power tools is sort of like a big “meh” for Black & Decker. They have sort of a topsy turvy foothold in the commercial sector wherever power tools, high grade cutting equipment and supporting accessories are in demand. Sad to say that with the release of the Black & Decker BDECS300C 13 Amp Circular Saw with Laser, the company couldn’t woo the hearts of professional wood workers. What’s even more ironic is that this model was released in September 2016; the developers had plenty of time to research and manufacture a circular saw truly worthy of experts out there, but something went wrong. In that realm, it is absolutely safe to say that this saw is for entry level enthusiasts and DIY project fans. You read that right. Beyond the attractive price tag, the saw does not have a lot to offer. It does increase the affordability margin for woodworkers, and to be honest, the “laser beam” wording leaves a positive impression on curious buyers. I also bought this saw for the same reasons as you probably did – i.e. there is a laser beam in there that’d ideally pave your way to perfection and beyond. On the contrary, despite of the straight line laser beam projection, the saw’s blade cannot endure a lot of pressure. This causes the saw to sway a little towards the sides, hence making straight cuts a nightmare halfway through a sheet. To best get through this dilemma, you are going to have to practice a little. At its core, this Black and Decker circular saw is not that bad. It “does” work as advertised, but there are so many limitations to achieving those results. Take, for instance, the wobbly safety guard. It can melt if the saw is in constant use for a little over 45 minutes. Therefore, I’d rather keep an eye out for any possible injuries instead of focusing on the project. The good thing is that Black & Decker is offering a ‘No Questions Asked’ 30 day returns and replacement warranty on the model: BDECS300C. In case of any grudges, or genuine issues, you can take the saw back to the vendor for immediate help. They can also hook you up for trade ins with a slightly better product and difference of additional payment. 13 Amp-Hour Performance at the Cost of 1 Volt Only! This issue is not directly related to the Black & Decker BDECS300C corded circular saw; it is more a matter of common sense for international users. Since the company’s products are very popular, overseas buyers and businesses import them for commercial use. 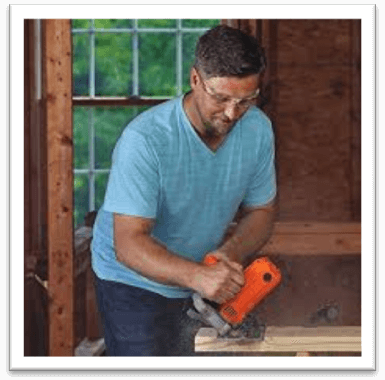 If you are considering purchasing any range of Black and Decker power tools, power drills, or circular saws, bear in mind that these sick puppies come with 110 – 120 V range. If your country operates electric equipment at 200 – 220 V frequency, NEVER EVER plug this saw directly into the power outlet. As soon as you’ll flick the switch to the ‘On’ position, the product will burn. To help avoid this problem, buy a step down voltage converter. Ask your nearest electronic products retailer and tell them that you have a Black & Decker BDECS300C saw with 110 – 120 voltage. He will give you a small adapter that’s supposed to reduce the charge output which directly comes from the wall outlet. Low Price/ Easy Affordability: The Black & Decker BDECS300C 13 Ampere corded circular saw is only available at a meager $40 or so. This price range ensures high affordability percentage for budget conscious buyers on a shoestring budget. Spindle Lock for quick blade replacement. Extra Hex Tool Key for easy winding and un-winding of the saw blade. Laser guided vision for straight line cuts. Serious Flaw in Security: Black & Decker needs to revise the BDECS300C model with a new and improved safety guard cover for the blade. Blade sways on the side if more pressure is exerted. You can reduce this issue by using plywood planks or low density material. There is no guarantee for max 5300 RPM revs; the saw’s performance is proportional to the density of the cutting material. On a general scale, this saw is a convenient tool for beginner level users. As a matter of fact, there were not a lot of complaints from such users on the internet. Those who did raise a few issues were either confused about the voltage, or they needed a more high powered tool with better enhanced features. To best get by with a long term satisfactory experience, I’d strongly advise that you keep your expectations aligned with the product’s performance. To be honest, any $40 tool is not going to lead you anywhere – for as long as you are considering using it for on-site professional construction work. On the contrary, the Black & Decker BDECS300C corded saw is a marvelous product in its own league. Especially, if it comes to people who are looking to create wooden boxes, book shelves, benches and other stuff which doesn’t require a lot of angled cuts. ​This is a bit of a setback for those who have prior experience with making bevel cuts through a circular saw. It doesn’t matter if it is a corded saw or a cordless circular saw, a lot of models allow angled/ bevel cuts to a certain extent. These cuts redefine and enhance the visual experience of the end project that you are working on. In case of the Black & Decker BDECS300C model, it means that it is only restricted to 0 – 45 degree bevel cuts. What does that mean for you? You will not be able to cut wood planks at angles beyond the 45 degree range. The only way to avoid this sticky situation halfway through the project is by either designing a blueprint which does not involve a lot of angled cuts, or by remaining within a specific bevel angle range which this model was made for. Newbies are more likely to make such mistakes. Professionals, on the other hand, know what they are dealing with. Therefore, they buy circular saws with added features and support for high quality work from brands such as Dewalt DCS391B or Milwaukee 2630-20. 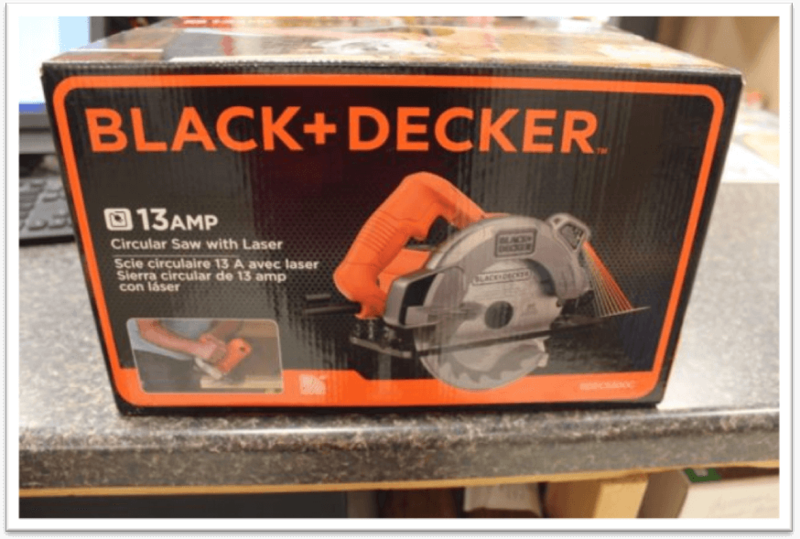 Regardless, Black & Decker has maintained a 4+ rating at various online retailer websites, including Amazon and eBay as well. 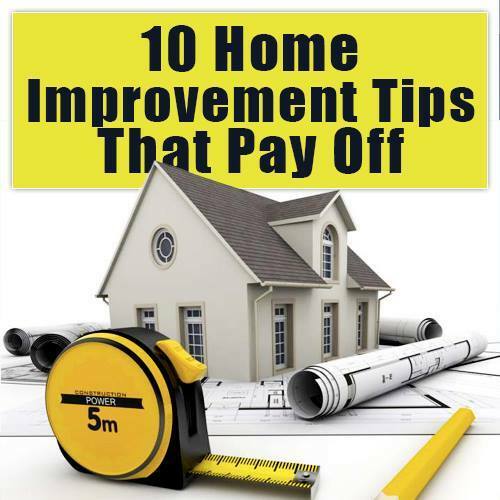 Most of these positive reviews come from people who are DIY enthusiasts. The saw can take a bit of rough beating from aggressive workers. I am not only talking about the durability factor here, but the performance results as well. For instance, if you recall, I mentioned that this circular saw can go beyond the 7 ½ inch depth with the right type of wood. Some materials are dense, so there’s no guarantee if the saw will go beyond 6” for that matter. However, for 4 x 4 plywood sheets, sawing single planks at a time, etc. you can get things done with speed and accuracy. You can hit the mark with a tad bit of practice and the good ol’ elbow grease. The Black & Decker BDECS300C 13 Amp Circular Saw is basically ideal for entry to intermediate level users. Be honest with yourself; are you a professional or an “aspiring professional”? There is a big difference. While we all crave patina coated, triple waxed shiny woodwork projects, it all comes down to the users’ skill. With a stainless steel housing and a cranky safety guard, you are in for a medium level product. It is not an ideal match for experts, but it’s definitely a great convenience for beginners. By the way, the Black & Decker guys are offering a 2 year coverage warranty on this Black and Decker saw. You can avail it anytime in case it breaks down or wheezes out without any prior warnings. Do bear in mind that the product warranty is subject to certain terms and conditions. Still not sure which circular saw to buy? 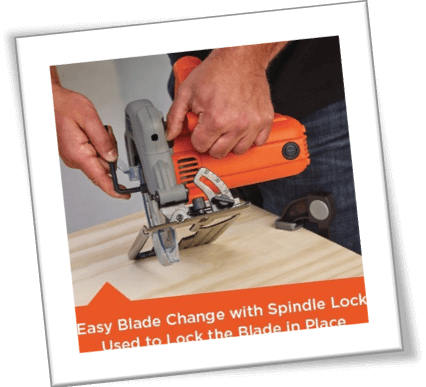 You can compare the most affordable circular saws here and read our complete circular saw tool guide in the tool guide section. Hope this helps you make your decision on which saw you should buy.